Lemon, cherry, apple, pumpkin, pecan - so many delicious flavors of pie! 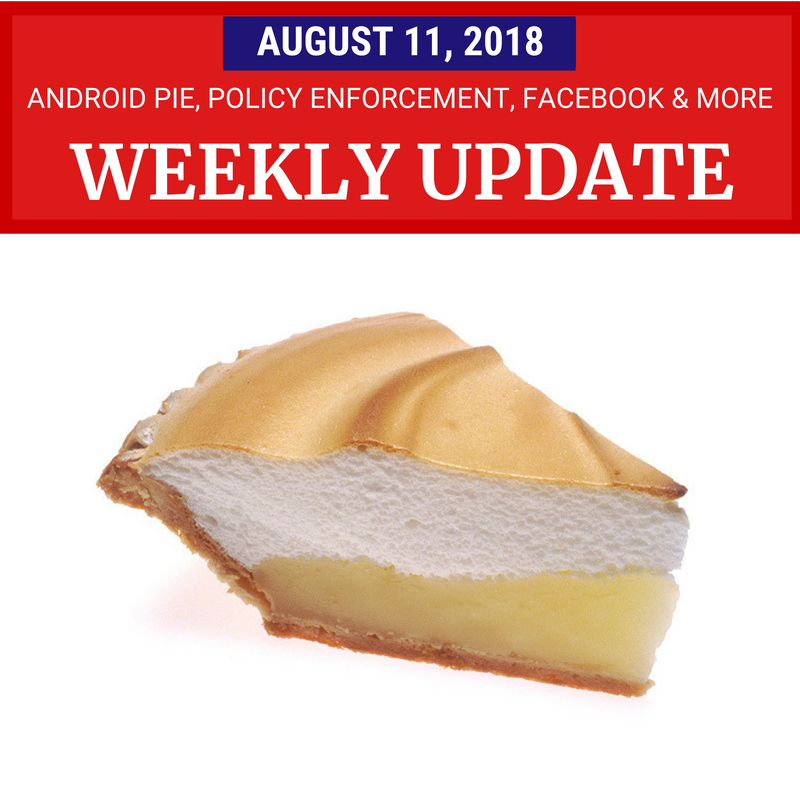 This week Google officially introduced Android 9 Pie. There are improvements in navigation and notifications, and AI-powered features including Adaptive Battery, Adaptive Brightness, Smart Text Selection and App Actions. So far I’ve found it delicious. One of the themes at Google I/O this year was digital wellbeing - features integrated across Google products to help balance their time online with their time offline. Now if you have a Pixel phone with Android 9, you can preview the beta version of these features. It includes a dashboard to give you an overview of the time you spend on your device, app times to limit your use, and a “wind down” option that gets you ready for bedtime by putting your phone in do not disturb mode and fading the screen to grayscale. (Facebook and Instagram also offer tools to help you manage your time on those platforms). Controversial radio show host and conspiracy theorist Alex Jones was suspended on multiple sites this week, including Facebook, Spotify, Apple’s Podcasts, and YouTube, From the scrambling around, it looks very much like at least some of Jones’ content has long violated the various platforms’ policies, but only triggered a suspension after increasing media scrutiny. Twitter was one of the lone holdouts, and their decision not suspend Jones’ account brought heavy criticism, soul searching, and several rounds of policy clarifications. His show’s Google+ Page is still up and active too, but so far that has been largely unnoted by the media, beyond a single snarky article. Facebook is trying to bring authenticity and transparency to Pages with a large following in the US, by adding information about mergers and name changes, and requiring Page managers to secure their accounts and verify their country of residence. And on the local front, Pages for local businesses are getting a redesign, and new features to improve discoverability. And there are tips and updates for YouTubers, Plussers, Business owners and more. Read on for details.